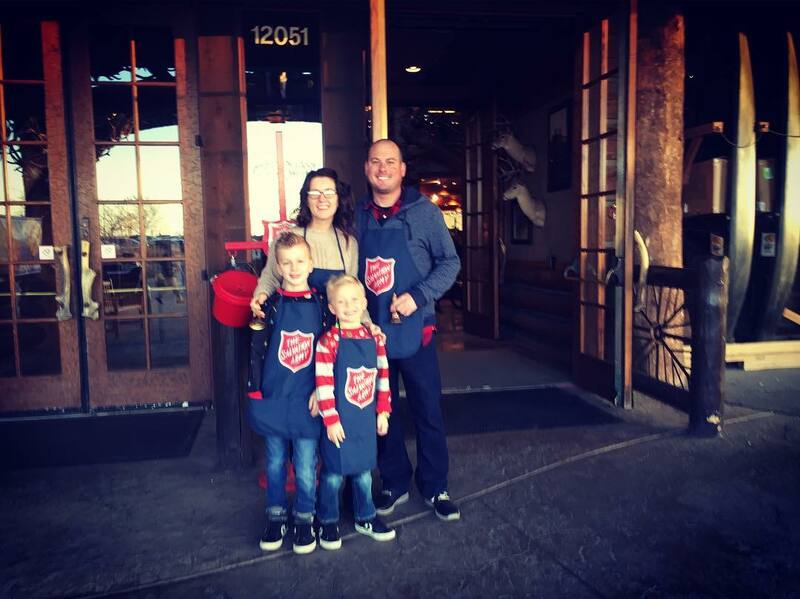 Last year we rang the Salvation Army bell on what was the 5th coldest day in the history of Kansas City. When I made mention of doing it again this year the only stipulation was that I do it sooner vs. later in hopes it would be warmer. We were limited on dates when we pulled up our calendar but Friday, December 1st was open for us and the slot needed filled at Bass Pro so we signed up. We figured that we would keep with tradition, while we were there we would see Santa & then we would venture our for a family dinner at Texas Roadhouse to warm up on some yummy buttery rolls and loaded sweet potatoes. 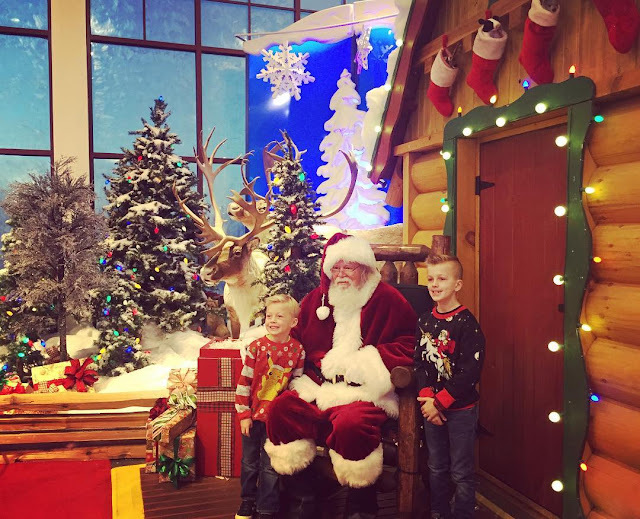 The weather was sooooo much better but as the sun started to go down it started to get a little chilly so they boys and I ran in to hop in line to see Santa. We had the earliest pass possible so we knew we wouldn't have to wait for long and we didn't. 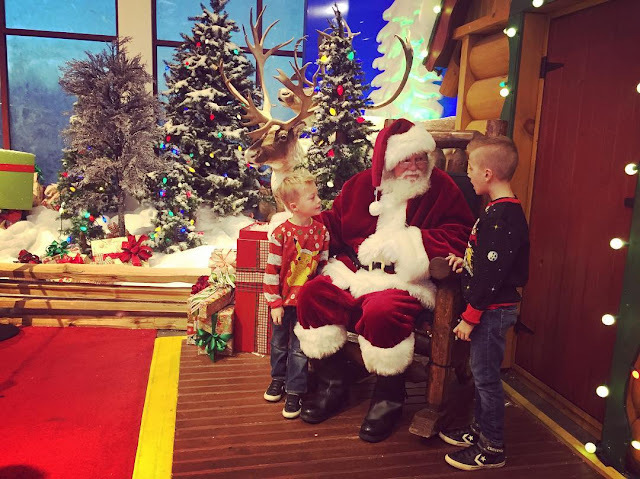 In no time we were at the front of the line and the boys were ready for their chat with Good Ole' Saint Nick. There were some very intense conversations going on too. Kaden was explaining that he would like a hoverboard and Logan wanted a Nintendo Switch---the first he has mentioned this! & then they both posed with picture perfect smiles. I kind of love that we keep going to the same place year after year. After their chat with Santa we rejoined Justin to finish our time ringing the bell. The boys were pretty good helpers too--they each had a door. They made sure to hit the button in time for the doors to open up as everyone was entering and as they passed through, they would wish them a Merry Christmas. And a little over halfway through I had to take a break to make them a couple hot chocolates. Grandma Sara knew we were ringing the bell so she had sent home a few packets of hot chocolate and they had to make sure to drink them while they were ringing. They were working pretty hard, most of the time, so I guess a little treat is okay. Two traditions, one relatively new and the other not so new, all wrapped up in one evening. An evening that I got to spend with the people I love the most while helping make a difference in some lives and spreading a little joy to others.